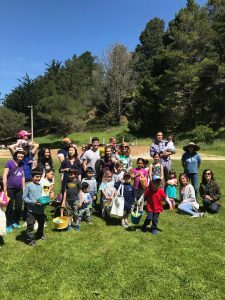 The South San Francisco Mothers Club has a lot to offer, and we look forward to active and enthusiastic members joining our community! From our Mother's Day Tea Party to the Spring Fling, Summer Picnic, Fall Party, and Winter Holiday Party, family fun is on the agenda. We also offer valuable "me time" through our Moms Only Events such as Book Club, spa days, game nights, and movie nights. We do playdates and walking dates to fit members' schedules, and we welcome event ideas from members. Other club services include bi-monthly newsletters, in which we introduce new members, share articles, recipes, and preview upcoming events; Annual Swap Meets, which allow members to share and exchange baby and kid gear; and In-A-Pinch, which provides meals to members who have a family emergency or have just delivered a new baby. Because we are 100% volunteer-run, we require all members to volunteer four hours per year. Planning parties, writing articles for our newsletter, organizing for fundraisers, volunteering at events, delivering an In-A-Pinch meal, or being a board member are all ways to earn your hours. The best part of being a member of our club is making new friends and knowing you have the support of other local families as you raise your child(ren).